This particular clock was created for the French gentry of that time, and was very much in keeping with the style of this era. Clocks during this era were made from fine materials with no expense spared on high quality wood, bronze and enamel. The rather unexpected inclusion of bronze sphinxes at either side of this clock has a particular explanation. In 1804, Napoleon Bonaparte crowned himself Emperor of France, modelling himself on the Roman emperor Augustus (63 BC – 14 AD) due to his ambition to create a French empire. Both emperors led a major battle in Egypt and images of grand symbols such as sphinxes and obelisks were used for propaganda purposes. The inclusion of sphinxes celebrated Napoleon’s conquest of Egypt and were thereby popular with the French gentry. Napoleon’s Egyptian campaign started a new fascination with Egypt and led to the field of Egyptology after signifcant ancient antiquities were discovered. The Parisian clockmaker Dieudonné Kinable (1794 – 1830) was based at Palais Royal no 131. Palais Royal at that time was home to many distinguished clockmakers. 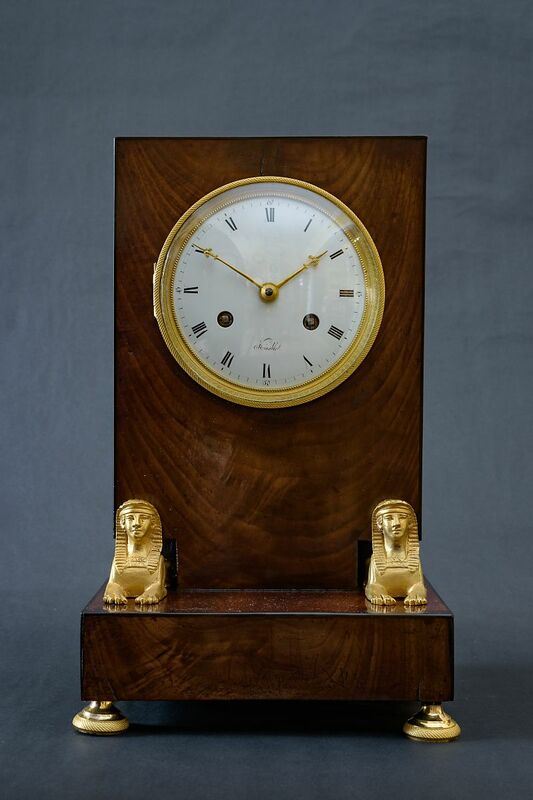 Kinable was one of the more celebrated clockmakers of this period, indeed King George IV purchased one of his clocks in 1828 which remained in the Queen’s Royal collection until recently. Palais Royal is a royal palace which opened in 1639, first home to Cardinal Richelieu and later a childhood home of Louis XIV. The palace and gardens are now open to the public and located opposite the Louvre.